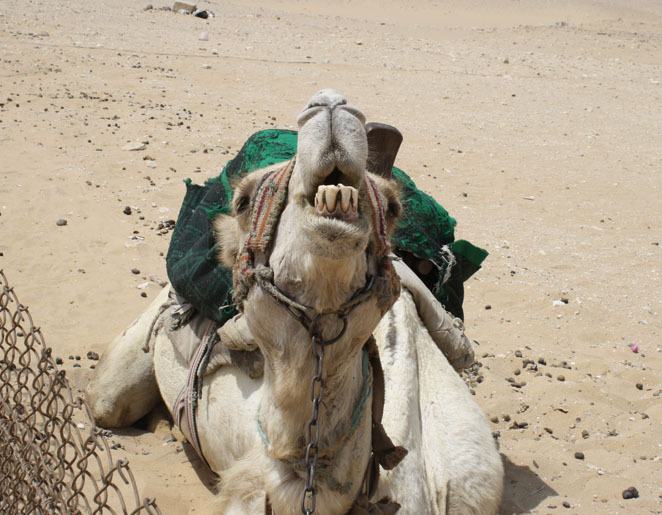 Today’s archaeology profession estimates the Pyramids of Giza to be about 4,600 years old. However, because the pyramids are made of stone, traditional dating methods using carbon-14 can’t be used to estimate their age. There really aren’t any good ways to determine when stone structures were built by examining the structures themselves – it is necessary to rely on organic material such as human remains found inside or near the structures. 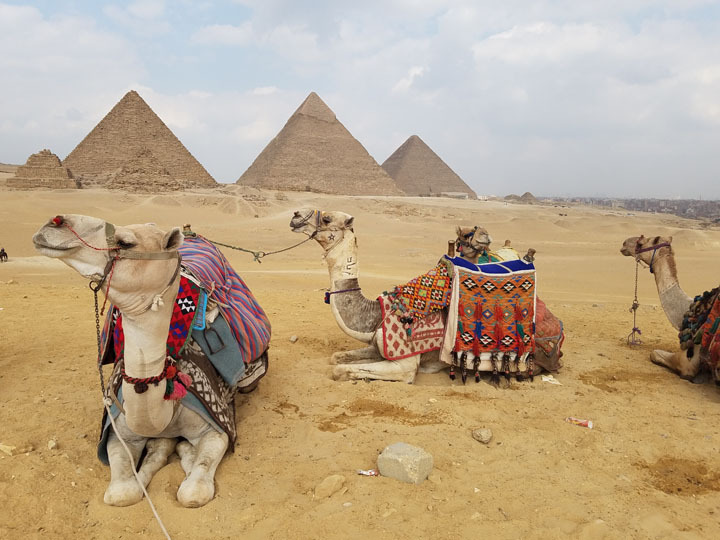 In the case of the three major Giza pyramids, bodies were not found inside, and therefore the carbon-14 dating has relied on artifacts found on the surrounding plateau, such as remains of bread in a fire pit. It’s a reasonable methodology, but it relies on the assumption that the pyramids were built at the same time as the village that surrounded them. However, what if the three large pyramids were built before the village? What if the village was built on top of something older which hasn’t been excavated yet? Photo copyright by Jewel, 2017. All rights reserved. What if the Pyramids of Giza are Older Than Believed? However, perhaps a clue lies elsewhere to the age of the pyramids? An ostrich egg was found in a tomb near Aswan that shows 3 triangular structures side by side. According to carbon dating methods, the human remains found in that same tomb were 7,000 years old. Therefore it is reasonable to think objects found in that tomb, including the egg, were equally old. Could the triangles etched on that presumably 7,000-year-old egg represent the pyramids of Giza? Some people think so, while others are skeptics. Alongside the triangles, there’s a marking that some people think could represent the Nile river and the Fayoum Oasis. But again, others are skeptics. I haven’t seen any debate questioning that the egg itself is 7,000 years old. That seems to be accepted. The debate I’ve seen centers around what the drawing represents. Ie, does it represent the Giza pyramids, Nile River, and Fayoum Oasis as the theorists claim? Or does it represent something else? Some skeptics have suggested that the 3 triangles might represent the Nubian pyramids of Sudan in the Meroitic kingdom of Kush. 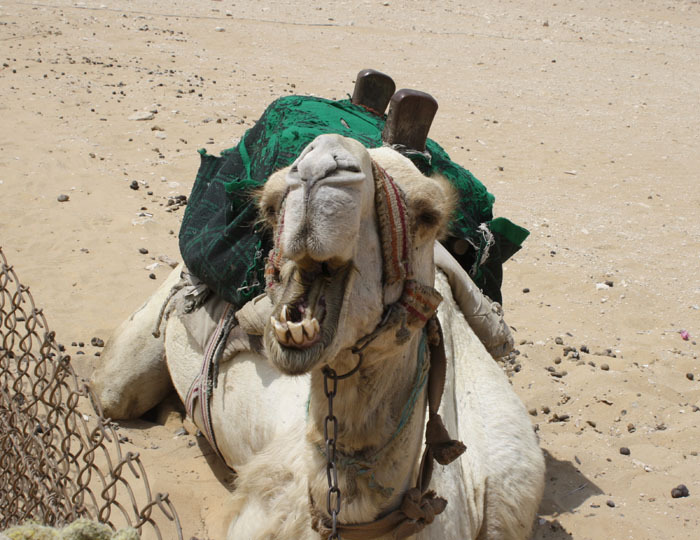 However, the Sudanese pyramids marked tombs, and were built much more recently (4,600 years ago) than the tomb the ostrich egg was found in (7,000 years ago). 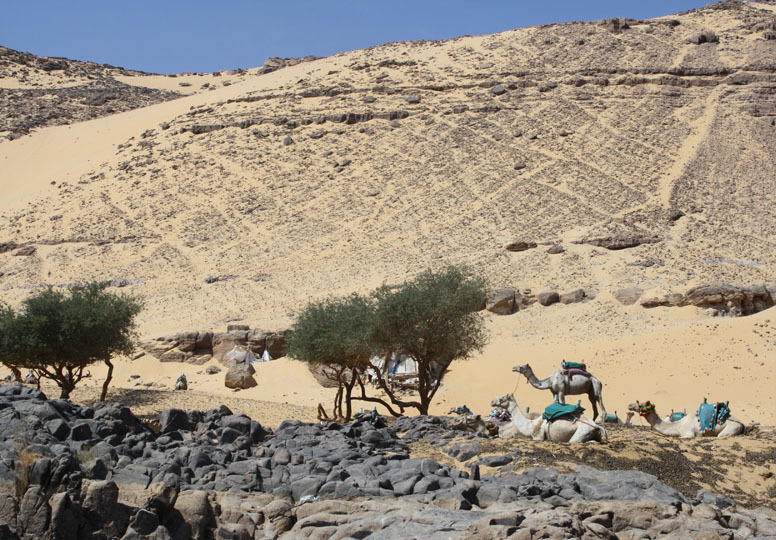 The Nubian pyramids are also much farther south than where the egg was found, in what (during ancient times) would have been a different kingdom from the one governing the Aswan area where the egg was found. 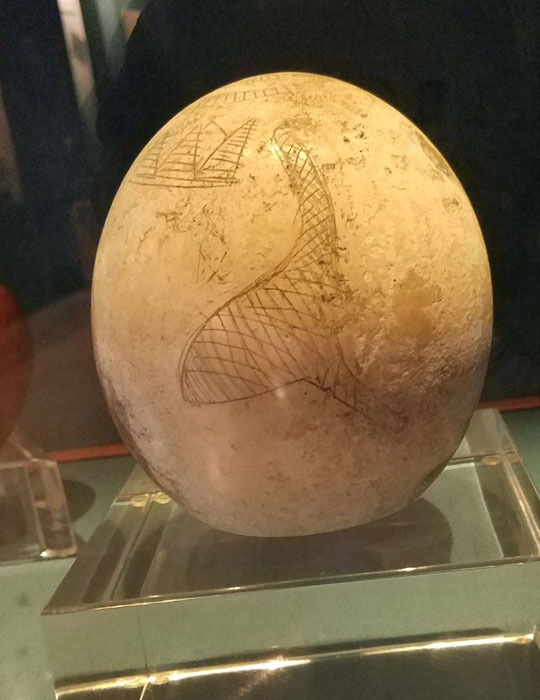 Today, the ostrich egg resides in the Nubian Museum in Aswan, Egypt. 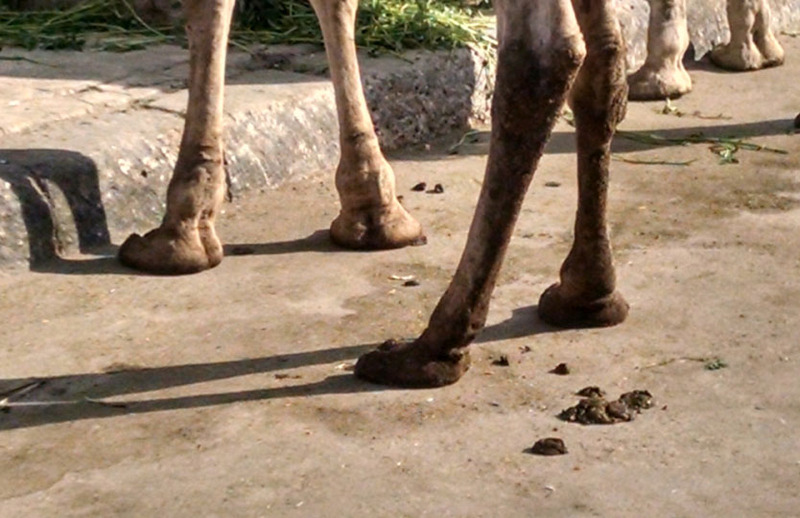 I had the pleasure of seeing it firsthand myself on May 6, 2018 while I was in Aswan. It’s fascinating to look at this 7,000-year-old object and try to come up with alternate theories for what the image is showing. So far, I keep coming back to the conclusion that maybe it does prove that the Pyramids of Giza are older than what mainstream archaeologists currently believe. I look forward to seeing how future discoveries enhance our insight into the past. Traveling offers many opportunities to see beautiful sunrises and sunsets. 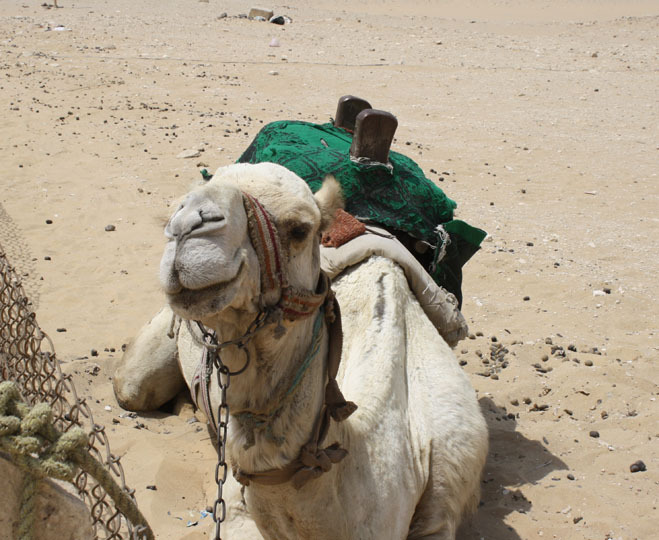 In this blog post, I’d like to share my photos taken in Egypt, Morocco, and Senegal. These are all my original photos, and my property. Please do not steal them. I have traveled to Egypt 12 times, so naturally I’ve had many opportunities over the years to photograph sunrises and sunsets there. Here are my favorites. 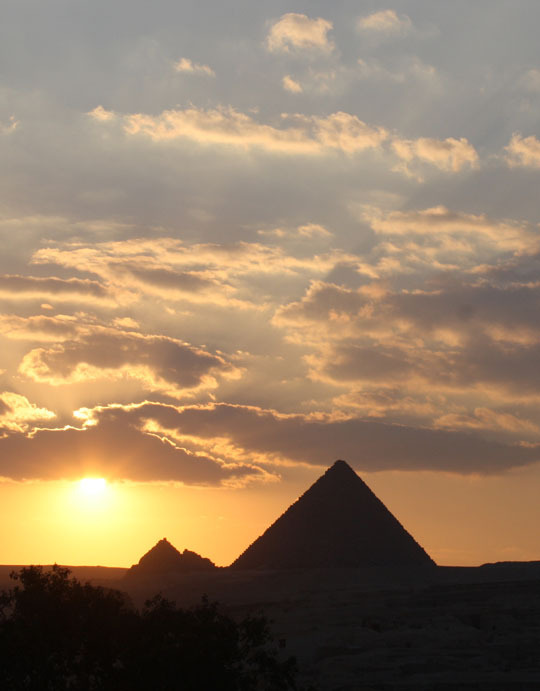 Any post celebrating sunsets in Egypt clearly needs to start with the sun setting behind the Pyramids of Giza! This sunset photo was taken in February, 2017 when I went to Egypt as part of Sahra Kent’s “Journey Through Egypt 3” tour. 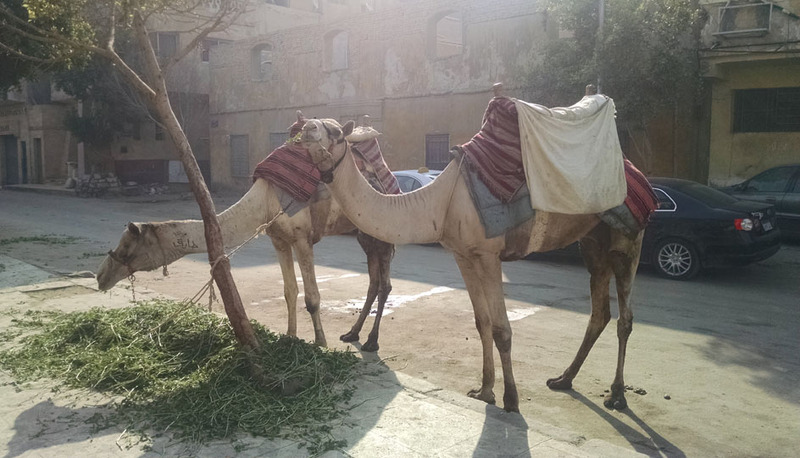 We stayed at the Sphinx Guest House, which is a bed & breakfast place in Giza, Egypt (near Cairo). This was the view from our window! 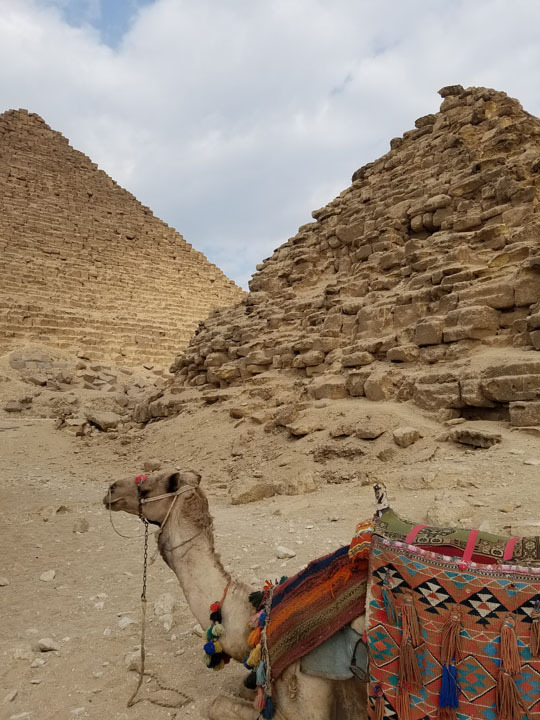 If you look closely, you can see the Sphinx in front of the middle pyramid. The sun sets behind the pyramids of Giza, Egypt on February 6, 2017. Look closely, and you’ll see the Sphinx hiding in front of the middle pyramid! And because I love Egypt and its pyramids so much, here’s a sunset photo I took in February 2016. 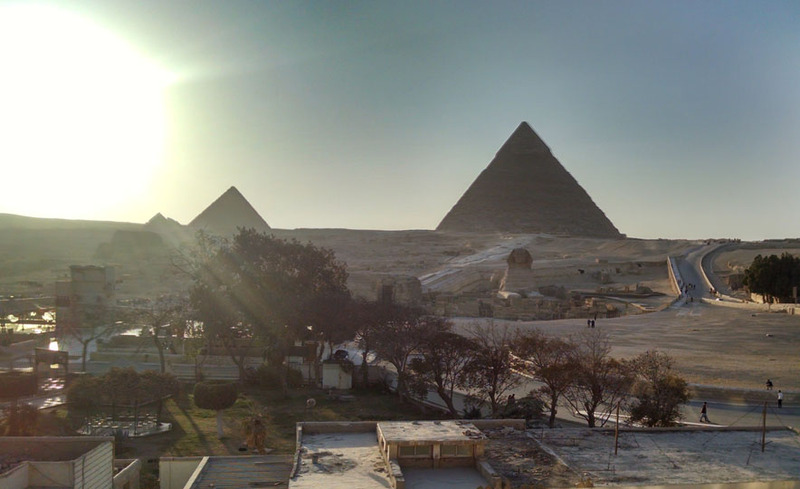 This year, too, I accompanied Sahra’s “Journey Through Egypt” tour, and I took this photo from my room at the Sphinx Guest House. The sun sets behind the pyramids of Giza, Egypt on February 10, 2016. 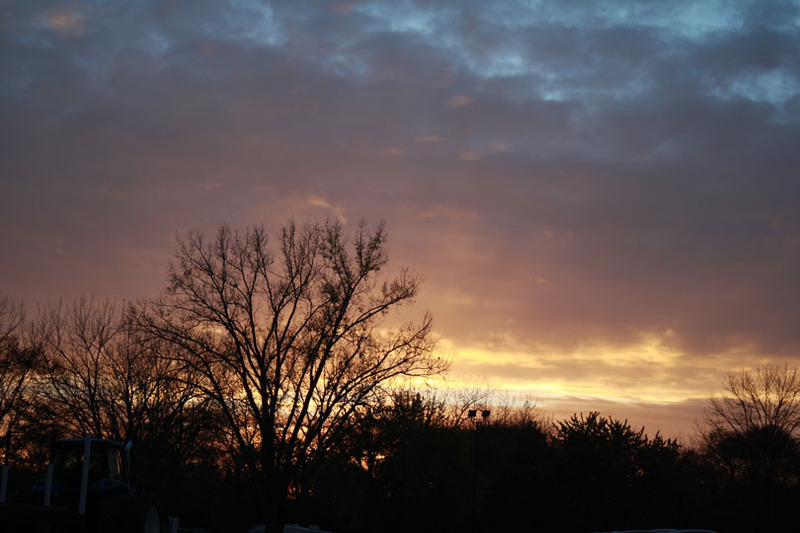 I caught the sunset at a different point in February, 2015. 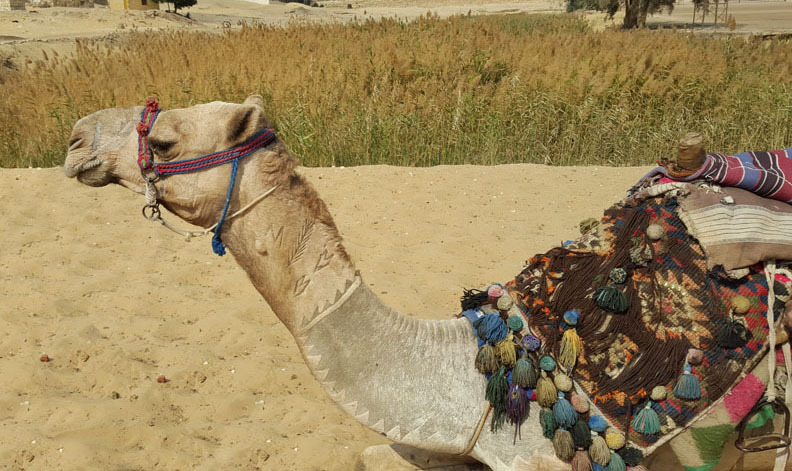 This year was the first time I accompanied Sahra on her “Journey Through Egypt” tour, but it wasn’t my first time in Egypt. This photo offers more light, and therefore a clearer view of the Sphinx. 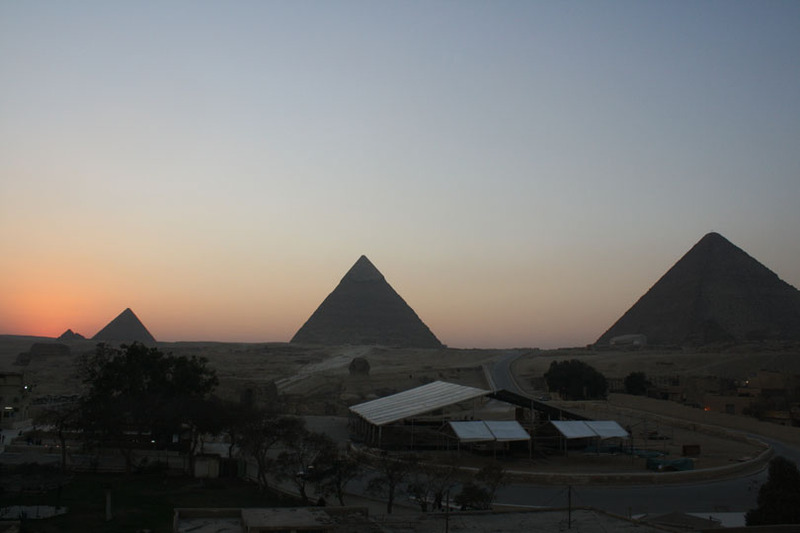 The sun sets behind the Pyramids and Sphinx in February, 2015. One of my favorite photos that I have taken in my travels is one of the moon rising over the Great Pyramid. I sat with friends in the garden cafe at the Mena House hotel, and this was our view. I had accompanied my friend Morocco to the Ahlan Wa Sahlan festival, which was held at Mena House. 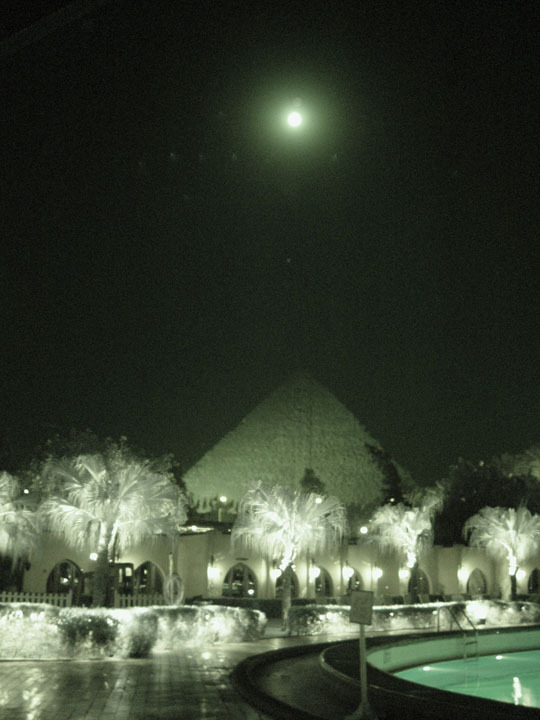 The moon rises over the Great Pyramid in June, 2004. 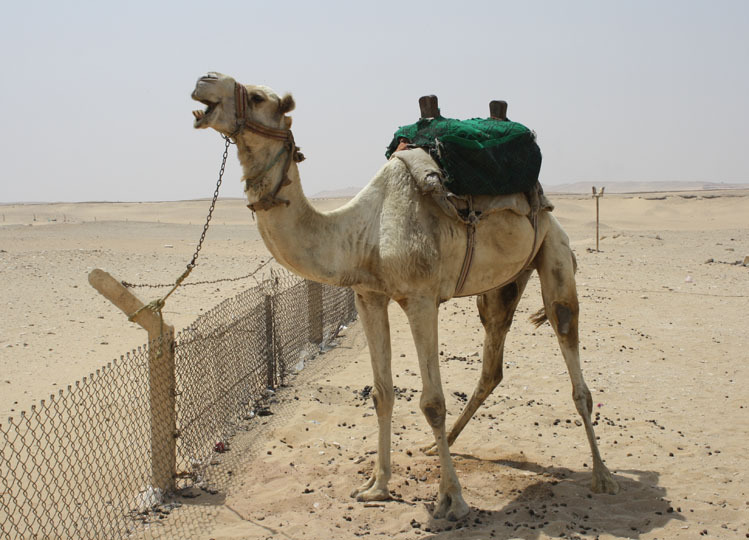 It’s about 400 miles from Cairo, Egypt to Luxor. An affordable way to make the trip is via an overnight train with sleeper cars. 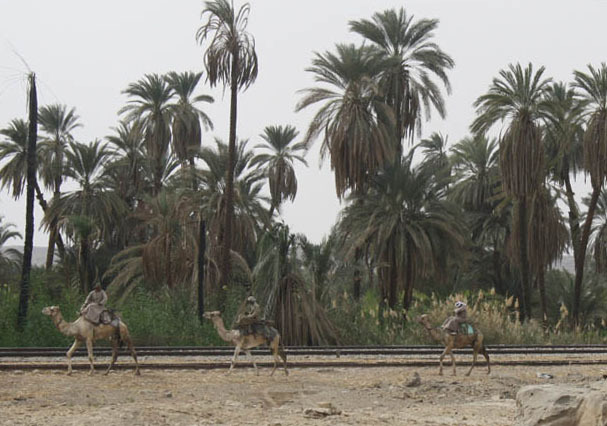 The train leaves Cairo late in the afternoon, which allows an opportunity to watch the sun set while you’re making the journey. I took this photo in February, 2016. 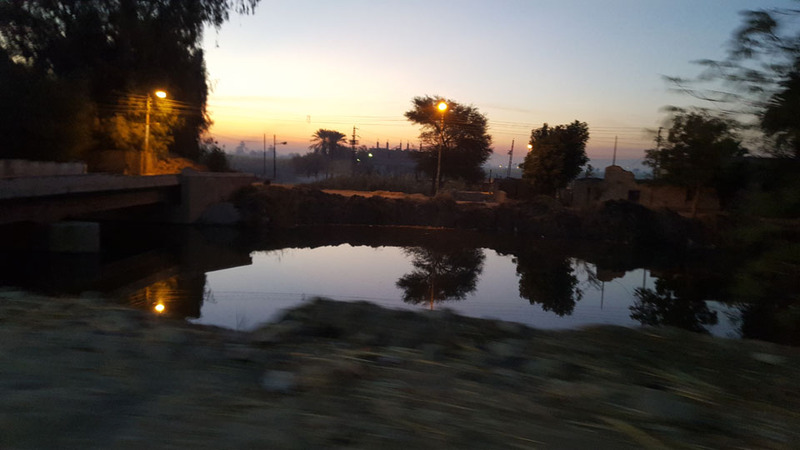 I saw this sunrise on the overnight train from Cairo to Luxor, Egypt early in the morning of February 14, 2016. Twice a year, on February 22 and October 22, the rays of the rising sun pierce the inner chamber of the Temple of Ramses at Abu Simbel, Egypt. On this date, the light shines on Amun-Ra of Karnak, Ra-Horakhti of Heliopolis and Ramses II, but the fourth god in the sanctuary, Ptah of Memphis, remains always in shadow. I was there for this event on February 22, 2015, when I accompanied Sahra Kent on her “Journey Through Egypt” tour. 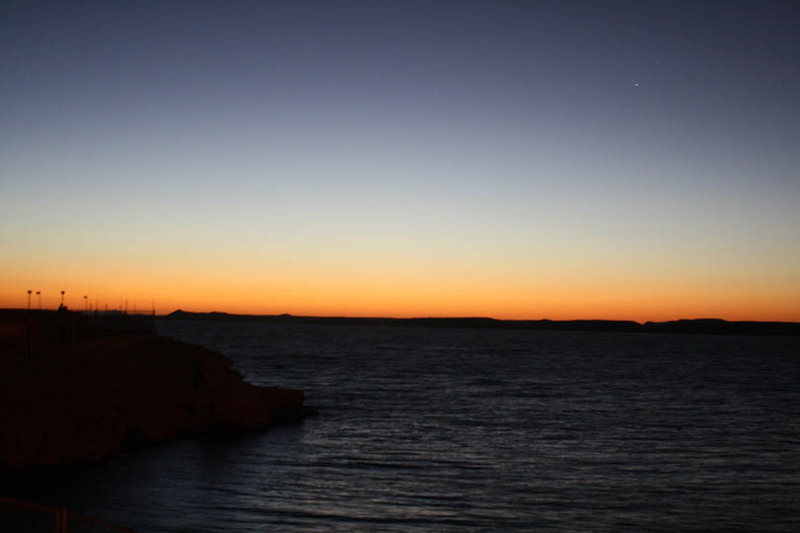 The glow of false dawn appears just before sunrise over Lake Nasser at Abu Simbel, Egypt on February 22, 2015. 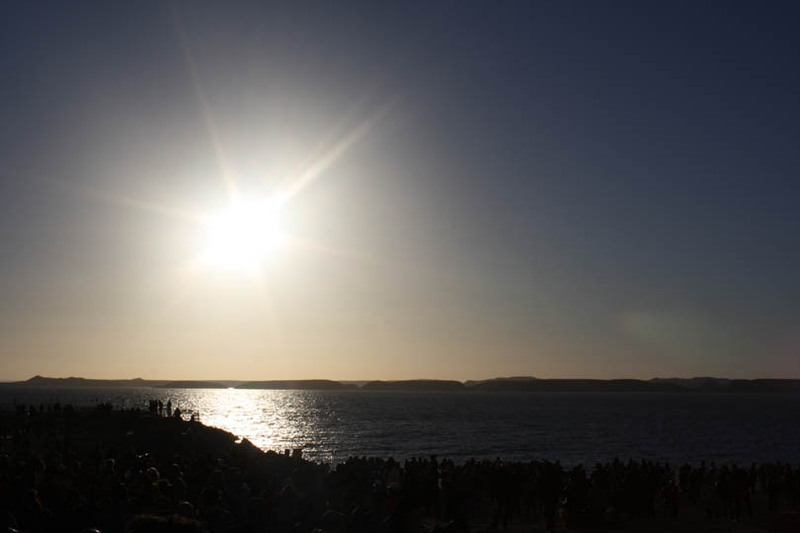 The sun rises over Lake Nasser at the Abu Simbel temple in southern Egypt on February 22, 2015. These photos are from my visit to Alexandria, Egypt in June, 2008. My friend Saqra and I went to a family-oriented beach one beautiful afternoon. Alexandria is a popular place for families from Cairo to spend vacation time during the summer, due to the fact that the sea air gives it cooler temperatures than Cairo. 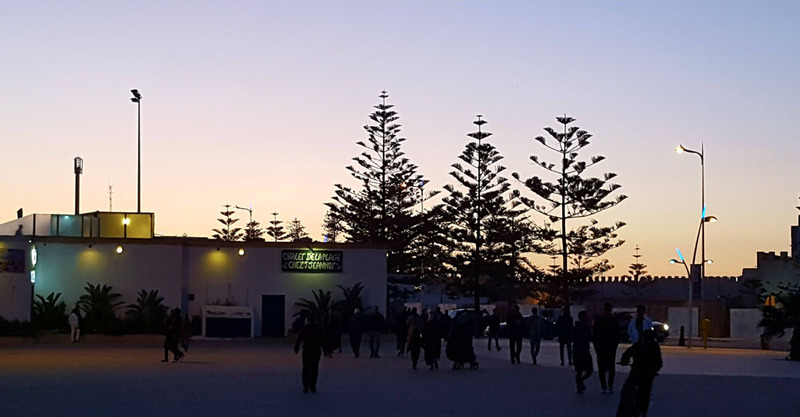 We stayed to watch the sun set, then went to the theater at the Alexandria Library to watch the show titled “The World Dances with Mahmoud Reda”. 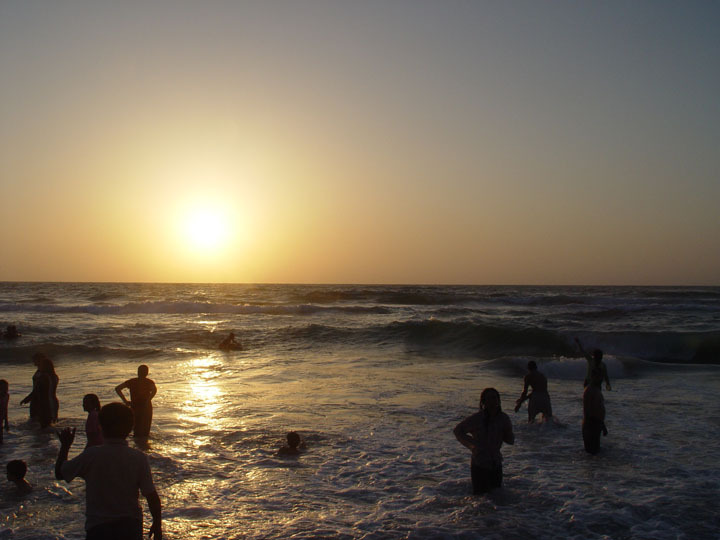 The sun sets over the Mediterranean Sea at Alexandria Egypt on June 30, 2008. Later in the sunset, as the light begins to fade, the sky remains beautiful and the sea takes on a range of colors. Essaouira is a seaside community in Morocco, facing onto the Atlantic Ocean. It offers beautiful views of the ocean, and also of sunsets. I was there for Funoon Dance Camp, which was organized by my friend Nawarra. The sun sets over Essaouira, Morocco, on September 10, 2017. 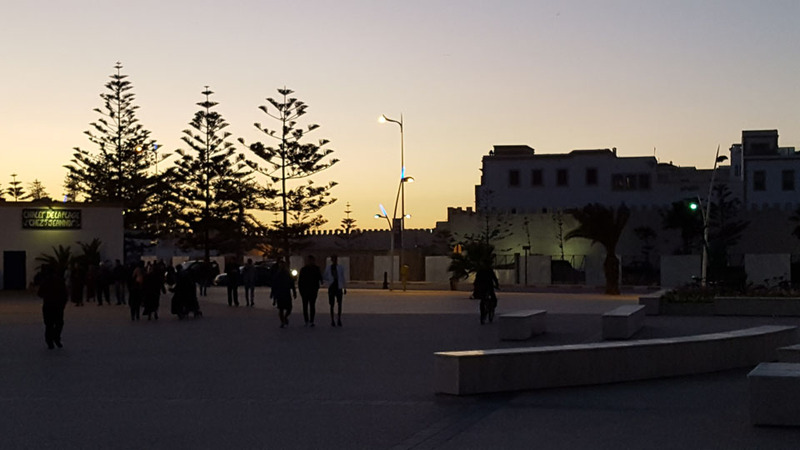 The sun sets over Essaouira, Morocco on September 10, 2017. 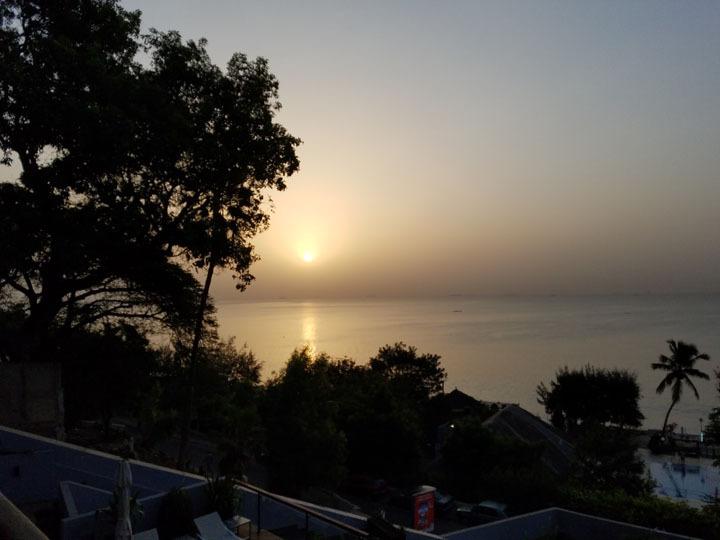 These two photos were both taken at sunrise (approximately 7:30 a.m.) in November, 2017, from the Pullman Hotel in Dakar, Senegal. 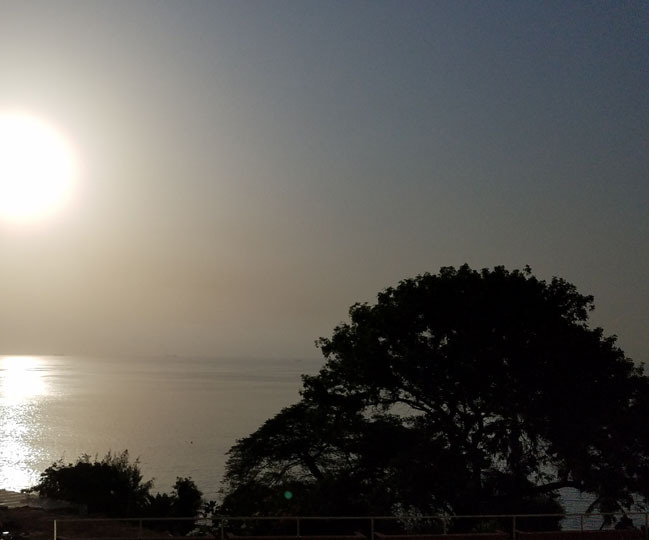 The sun rises over the Atlantic Ocean at Dakar, Senegal on November 1, 2017. The sun rises over the Atlantic Ocean at Dakar, Senegal on November 2, 2017. Gratuitous Sunsets in My Own Community! 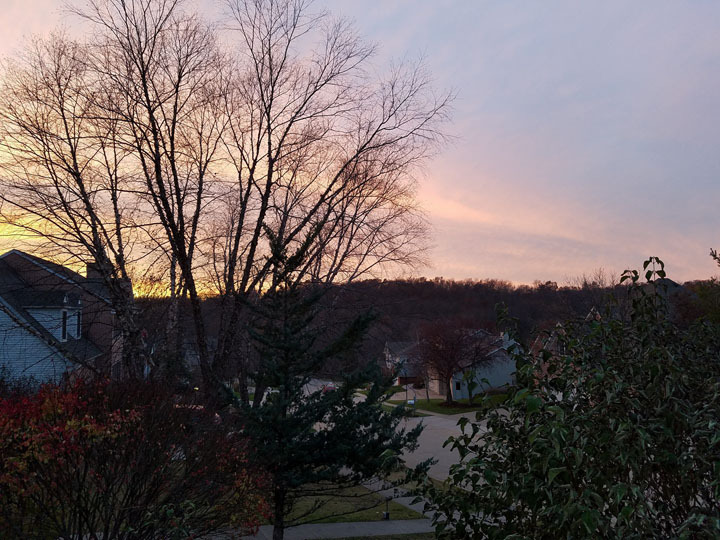 Although the primary theme of this post is African sunrises and sunsets, I can’t resist sharing some beautiful sunsets from my own neighborhood in Iowa City, Iowa. 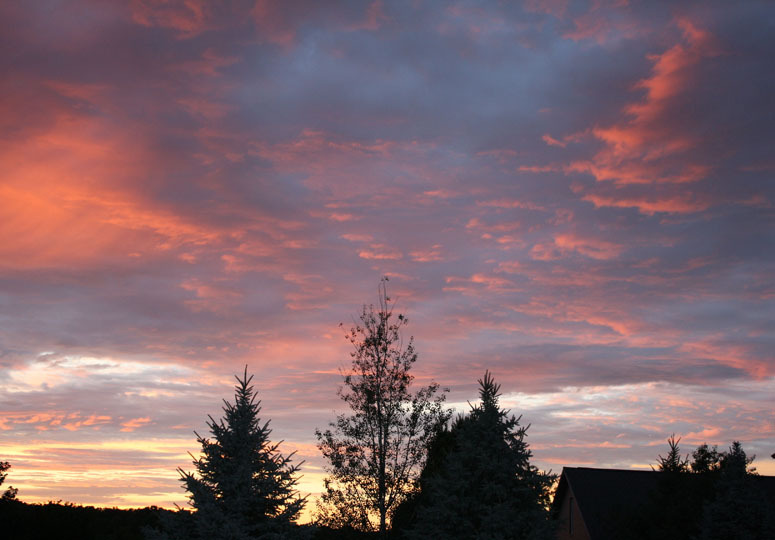 After all, it’s my blog, and I can include non-African sunsets if I want to! I don’t have to travel far to see beautiful sunsets. These two photos were taken from my front door, looking across the street at my neighbors’ houses. 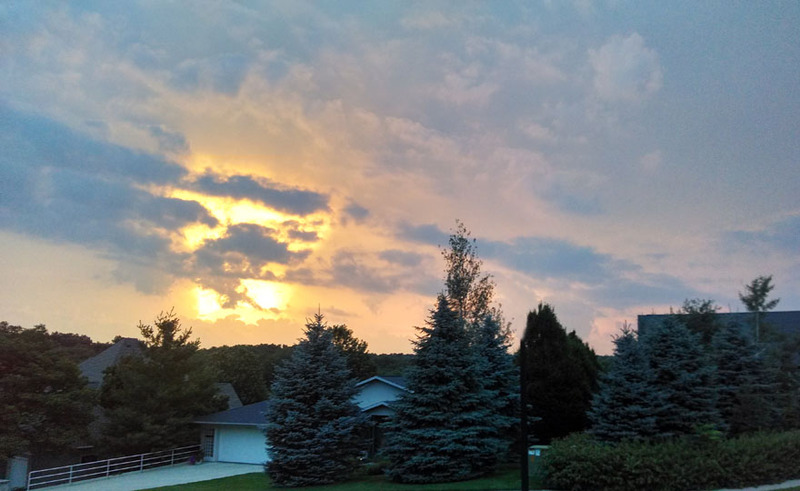 The sun sets over Hickory Hill Park in Iowa City, Iowa on July 6, 2014. The sun sets over Hickory Hill Park in Iowa City, Iowa on July 15, 2016. The sun sets over Hickory Hill Park in Iowa City, Iowa in November, 2017. And this photo was taken about a half hour’s drive from our house, at Coralville Lake. The sun sets over Coralville Lake on October 21, 2016.